One of the newest breweries in Minneapolis is trying to court a more ethnically diverse crowd than one typically found in many Twin Cities taprooms. 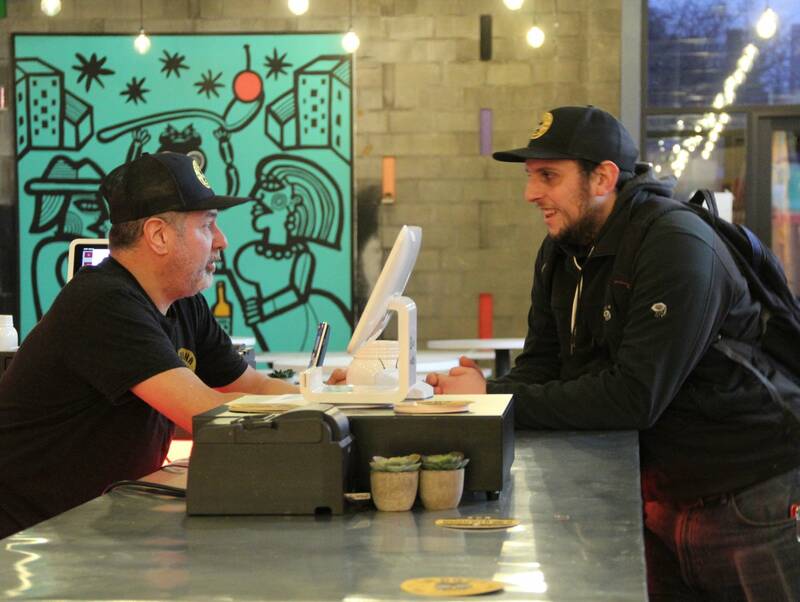 La Doña Cervecería opened this fall in the Harrison neighborhood of north Minneapolis. The brewery's commitment to inclusion is baked into its mission statement, which includes celebrating "the vibrancy, breadth and depth of Latino and Minnesotan culture." 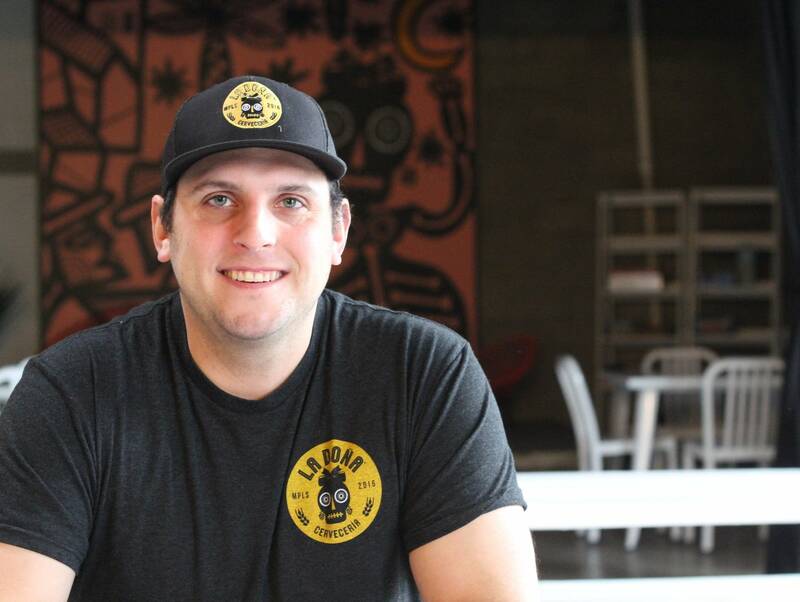 The brewery is the brainchild of 27-year-old Sergio Manancero, a Minnesota-born son of Uruguayan immigrants. Manancero wasn't drinking a lot of craft beer when the brewery scene took off in the Twin Cities. From 2009 to 2013, he was a combat engineer serving in the Marine Corps and was deployed twice to Afghanistan. But when he came home to Minnesota, he took up home brewing and started to check out the bevy of taprooms that had sprouted up while he was away. La Doña tries to offer something different — salsa nights on Saturdays, murals and other works by Latino artists, and he even plans to offer Spanish and English-language classes. It's registered with the state as a "public benefit corporation," which is a for-profit entity with socially minded purpose. We talked Manancero about his quest — and business strategy — to diversify the local craft-beer scene. Question: How did you come up with the idea of a Latino-influenced brewery? Answer. Both of my parents are from Uruguay, in South America. And so when I moved back to Minnesota and started getting into the craft beer scene, I noticed that everywhere I would go in Minneapolis, there was really only one type of crowd at the craft breweries. Q. What did the crowd look like? A. It was mostly Anglo-Saxon, a lot of Scandinavian white people, which is fine — I mean, it's Minneapolis. It's just that it was always kind weird to me that breweries couldn't get the same crowd that a bar could. I thought to myself, 'Why isn't there a higher proportion of Latinos?' In my life growing up, there was always Latin people surrounding me, so I knew that the community was large, and I didn't understand why they weren't drinking at craft breweries. I started talking to people in the Latin community about starting a Latin brewery, and they all thought it was a cool idea. They assisted me in whatever ways that they could. Q. How would you describe your brand? A. I would describe it as a mix between Latin culture and craft brewery. And then La Dona is more conceptual. Having a space that's welcoming to everyone and always inviting you in and having a beer with you and getting to know you on that level that only beer can take you to. It's about having a little bit of something for everybody to enjoy. If that's Latin music and Latin culture, and you want to drink a Mexican-style lager, we have that. But if you are a beer geek, we do creative brews. We have a really good head brewer, Dicky Lopez, who has 10 years of experience in many different breweries. Q. Was craft beer important to your parents? A. It wasn't really ever important to my parents. But I think that they're getting more into it now. My family is 100 percent supportive. My sister bartends here. My dad comes here every Sunday, and he pays for his drinks. Q. How successful are you in attracting a diverse crowd to your brewery? A. It's a very mixed audience. There's the hipster bikers that are here. They're very into craft beer, and it's a new brewery, and they want to try all the new brews. And I have the Latin people that are here to dance. And the people from the community in north Minneapolis who are predominantly African-American. And it's so cool to see that. People have brought it up to me, that it's not a crowd that you see typically in a brewery. Q. What does it teach you about how to make any space more inclusive? I think it raises the question of why more breweries haven't been successful at that. A. I think that's a curious thing as well. I think that it has a lot to do with just the access. For some people, I think that craft beer is kind of scary. There's a lot of crazy beer types, and they're all over the map, like a "hazy IPA that is dry-hopped 16 different ways." That appeals to a certain crowd. But the Latin crowd and the other minority crowds haven't quite crossed that threshold of enjoying craft beer in that way. Part of it is because that's not the type of beer that they drink. People come here and order Heineken ... and we're like, 'No, no, no. This is a craft brewery, and we make the beer here.' And even though it's a light, refreshing beer, and probably tastes closer like a Heineken, it's made with Minnesota ingredients, it's made with malt that we source from Patagonia, and it's made from hops with yeast strains that were imported from Mexico. What was missing is that people didn't have that education, and now as they more and more become craft beer drinkers, taprooms will start seeing more of it. I would say a good 50 percent of my staff speaks Spanish. When Latin people come to check out the cervecería that they hear about, they can talk to somebody that speaks Spanish, and they can explain the beers to them in Spanish. I think that's another part of how this taproom itself is just a little bit more accepting.